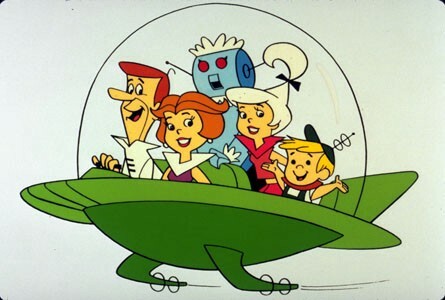 The 1960’s cartoon “The Jetsons”, envisioned the future with flying cars, push button food dispensers, widespread video communications and robots, lots of robots. Long before Americans had PC’s, cell phones, smart watches or Google glasses we already had a vision of how in the not to distant future, computers and robots would take the primary role in many of the jobs currently being performed by people. That vision of the future was recently re-enforced by an Oxford University study entitled “THE FUTURE OF EMPLOYMENT: HOW SUSCEPTIBLE ARE JOBS TO COMPUTERISATION?∗”. (Bloomberg thankfully reduced this 72 page study to a easy to understand visual graph.) 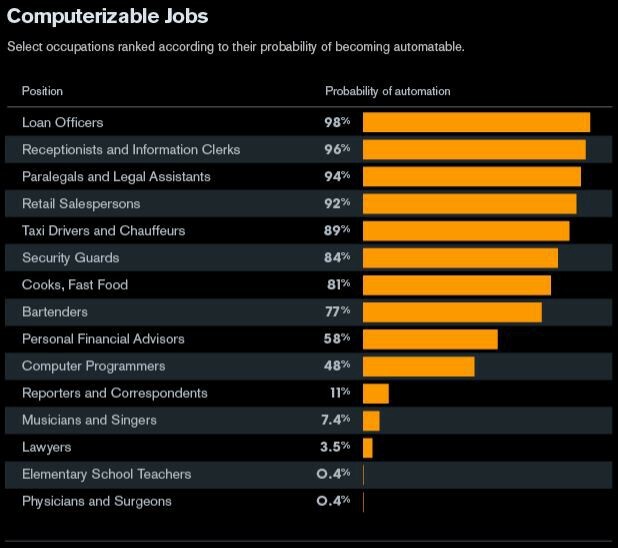 This study took a look at which jobs were most likely to be “computerized” or automated in some form by the use of technology. The study included a probability ranking for over 700 professions. The results conclude a shocking 47% of total US employment is in the high risk category for jobs that could expect to be automated relatively soon (within one to two decades). What does that mean for US workers? Will my job become obsolete as machines become more intelligent? It may be a bit scary to admit, but machines are better at some jobs then humans. The number of jobs machines perform better at then people expands every year. This is both logical and in most cases desirable. That was recently highlighted by a tongue-in-cheek story by the satire publication The Onion about factory workers who’s jobs were so monotonous and dangerous they were worried about the prospects of their jobs NOT being replaced by machines anytime soon. Fortunately machines do not typically operate in a zero sum jobs game. Having a machine perform a task in the workplace does not necessarily mean the elimination of a job for a person. More often than not, it introduces new job opportunities and demand for skilled positions to use or oversee the new technology. 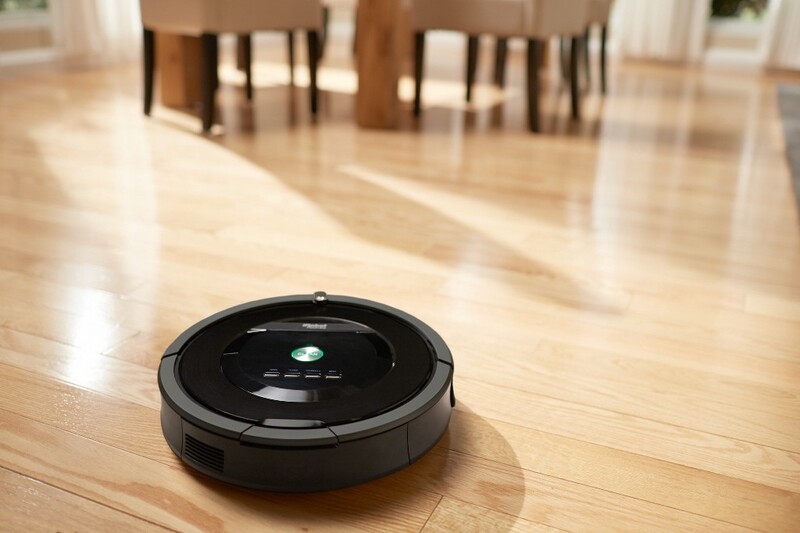 Machines will empower employees to work in new ways. Empowering employees to be more productive and effective at their jobs is the most common reason technology is brought into the workplace. In the category of remote workers we see this trend escalating quickly. There are already many real world examples of this. 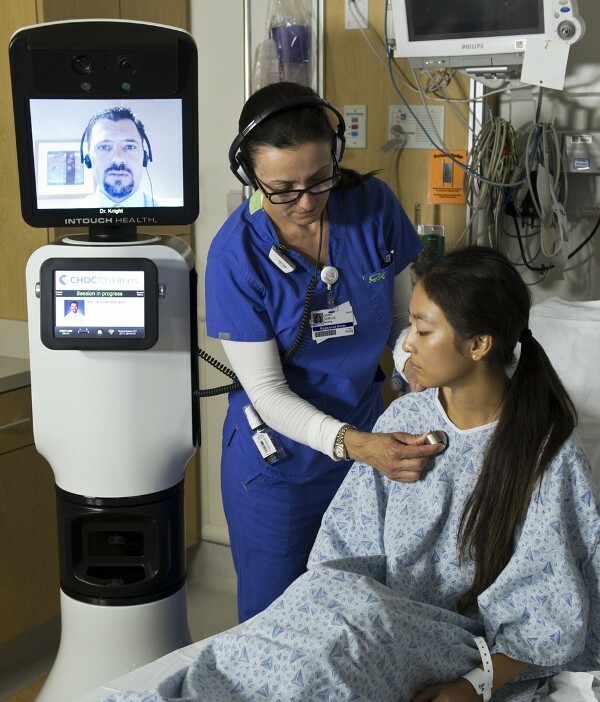 Robots enable doctors to be “virtually” in the room with patients from a remote location. This allows doctors to perform certain task with patients even when the doctor and patient are not in the same city. This saves time and allows the doctor to care for more people then they could if they had to travel between locations. 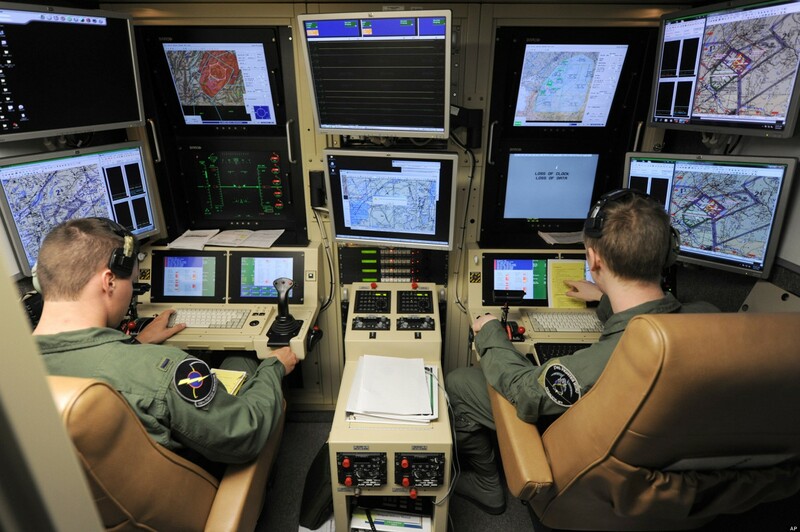 Military pilots are still in high demand, although more and more of them are flying with their feet firmly on the ground, while the drones they pilot fly over hostile sky’s. Other examples of people performing their jobs remotely via video connections include: University Professors, Security Guards, Bank Tellers, Support Agents and many, many others. I recently went to a Starbucks drive-through which had a outdoor screen on which I could see streaming video of the employee as they took my order. How did that make the employee more productive? I’m not sure, but it did add a personal touch that was more pleasant then the cold, impersonal loud speaker that greats me at other drive through locations. That’s an example of the use of video communication technology to improve consumer experience. Where else can you expect to see technology enabled remote workers? ALICE ReceptionistSystems allow remote Receptionist to communicate with building visitors. When we developed A.L.I.C.E (A Live Interactive Customer Experience) technology a few years back, we were breaking ground in how businesses could enable remote employees to communicate with customers. 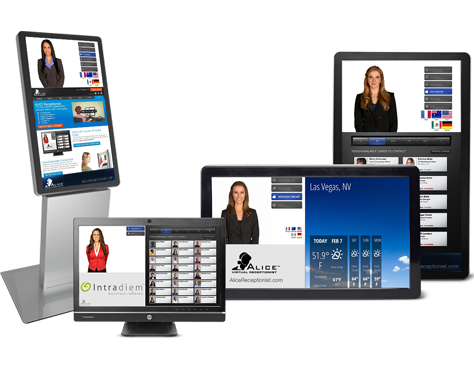 Today the use of two way video communication to interact with customers is becoming common place. Our ALICE Receptionist product is only one example. ALICE is an interactive solution that allows a company’s employees to remotely monitor and communicate with building visitors via two way video. Our Alice Receptionist systems are greeting building visitors for businesses and government agencies around the globe including in theUS, Canada, Europe, Australia, New Zealand and Jamaica. Using the ALICE Receptionist system, Receptionists are now far more productive, more secure, and can provide personal service and attention to visitors that previously would have required a company to staff a receptionist physically at each building entrance. As with any new technology user acceptance is key to a technology’s success in the market. This is especially true when that technology changes how we communicate with others. For remote video communications, the widespread acceptance by consumers of products like Skype (299 million users) and FaceTime (200+ million devices) has helped pave the way. Businesses are now using video communications not only internally (Microsoft Lync, Cisco TelePresence), but are also starting to use this technology to interact with customers, and customers welcoming the added personal interaction. For Robots, this also holds true. 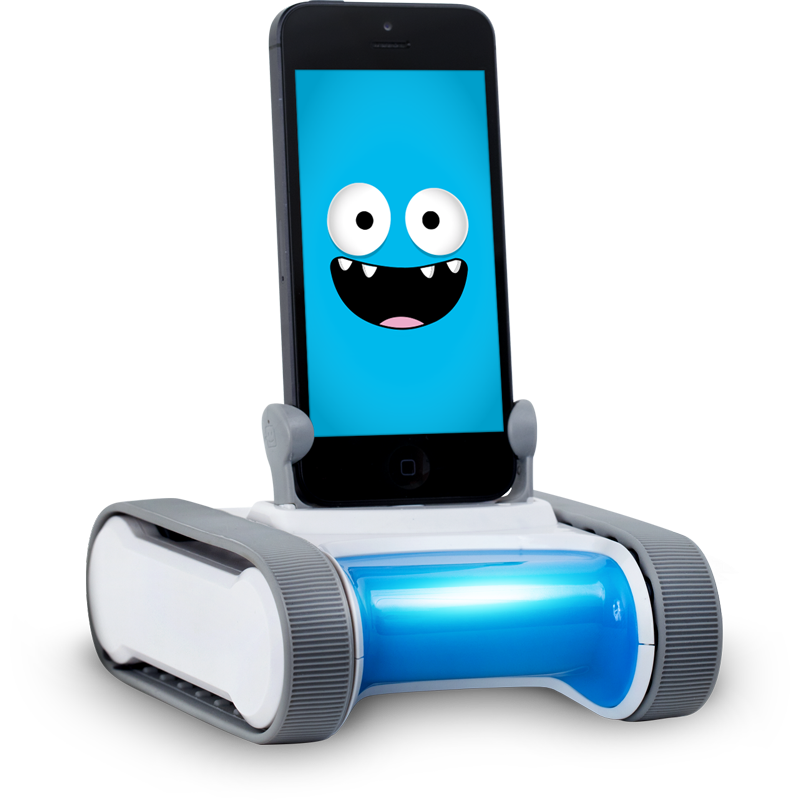 There are already a wide range of toy robots on the market that our children feel no hesitation in playing with. Robot kits are available to build your own robot. We continue to see an increasing use of them in our everyday lives in more professional and productive roles. Given this trend, it’s not hard to see the Jetsons vision of a robot led classroom in our future. A recent study by the University of Manitoba’s human Computer Interaction Lab, shows how accepting people already are to take orders from a robot boss, even when the robot is a toy. In the study 46% of volunteers followed the robot’s instructions. Maybe we should be less concerned about robots taking our jobs and more concerned about future robot bosses. This entry was posted in ALICE Receptionist on March 24, 2014 by ALICE Receptionist.